I recently put together a web page which attempts to look back through history and see how basketball arenas have evolved over the decades. It brings up not just architectural issues but also gives a glimpse into how political, economic and social issues of the day can affect the arenas where basketball is played (and subsequently the game itself), along with how popularity of the game can lead to bigger and better arenas. 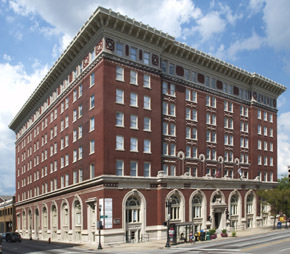 The webpage provides examples of typical facilities that Kentucky has played in during their history, so it involves a lot of college facilities, but it also includes a number of arenas used by professional basketball, so it is also relevant here. Here are the links (it's actually split into two parts). I'd be interested in any comments, not only with regards to the architectural progression but the socio-economic factors which have played a role in the development of the game. For example, looking back at professional basketball in the 1930s, I contend that the construction of government-funded municipal auditoriums etc. during that era was an important factor in laying the ground-work for the development and popularity of the game. Last edited by Jon Scott on Sun May 30, 2010 8:54 pm, edited 1 time in total. One socio-economic factor which I wonder about: segregation. Meaning of fans, not players (which is a subject that has already been covered extensively). On baseball's SABR list, there was a discussion several weeks ago about whether the ballpark in Washington DC where the Senators played was segregated. No one really knows, there seems to be a consensus that there was no de jure segregation i.e. no local laws requiring segregation, but there may very well have been de facto segregation by custom, i.e. fans knowing there was a "Black" area and a "White" area. So two similar questions arise for basketball arenas. Were any of them segregated de jure? I have no idea ... public facilities were segregated in a number of places but did this include basketball arenas? And then there's the de facto segregation ... possibly with certain sections of the arena, although that seems unlikely or unwieldy in a basketball context. More likely is segregation by arena or league, especially during the years when Blacks players simply were not hired by the NBA (again, there were no segregation laws that required the NBA to do this, they simply chose to do it by custom or mutual agreement), and Blacks had to play with barnstorming teams. I'd have to think that the fans were correspondingly segregated: games between Black teams having largely Black audiences, and games in most NBA cities with largely White audiences, but I do not know for sure. Certainly the Boston Garden in the 1980s was notably lacking in Black fans, even though the NBA itself had by then become dominated by Black players. It's not that there were any segregation laws keeping them out, nor AFAIK any notion that they would've been met with hostility, and there were certainly a few Blacks in the stands -- but not very many. I'm guessing that there are more Black fans of the Celtics nowadays but since I don't live there anymore I don't know. mtamada wrote: One socio-economic factor which I wonder about: segregation. Meaning of fans, not players (which is a subject that has already been covered extensively). You bring up some interesting questions, and one I don't know the answer to them. But just for the sake of the article, I was more interested in socio-economic factors that affected the architecture/design of the buildings themselves. For example to put it with respect to your question, perhaps there are some facilities that were designed with sections for blacks-only and separate sections for whites-only. I'm not aware of any examples of this with respect to basketball arenas but maybe there were ? Jon - Sorry to be so late on this post. Your photos are fantastic. But are you focusing strictly on municipal facilities? Pro basketball, of course, got its start in dance halls and other creative, fly-by-night venues. This is an important point because the lack of cookie-cutter facilities in the first half of the 20th century had a profound effect on basketball's evolution, from the cages to the first jump shots to slippery floors leading to the first zone defenses and fastbreaks. If that's not where you want to go, no problem. But it might be nice to pull it all together. Bob Kuska wrote: Jon - Sorry to be so late on this post. Your photos are fantastic. But are you focusing strictly on municipal facilities? Pro basketball, of course, got its start in dance halls and other creative, fly-by-night venues. This is an important point because the lack of cookie-cutter facilities in the first half of the 20th century had a profound effect on basketball's evolution, from the cages to the first jump shots to slippery floors leading to the first zone defenses and fastbreaks. If that's not where you want to go, no problem. But it might be nice to pull it all together. If you follow the link, you'll see that there are many early examples where basketball was played in relatively strange places. YMCA's was a common place at the time along with early college gymnasiums (typically those were small and designed primarily for gymnastics, often with a running track suspended above). But there were also games held in churches, in roller skating rinks, in auditoriums designed more for concerts, in places designed primarily for livestock shows etc. 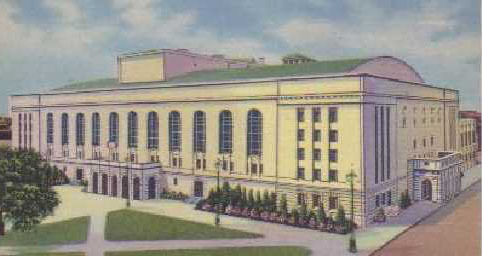 More recently, the Hippodrome in Nashville was a place that UK played Vanderbilt many times in the 1930's and 40's and it was primarily a roller rink. As far as the comment about the lack of regulation of the courts, facilities etc. having an impact on the development of the game is exactly right. I know especially around the turn of the century there was often talk of irregularities of the court impacting the game. From low ceilings, to beams on the court itself that people had to avoid, to irregular courts etc. I'm not sure exactly when but I don't think it was until sometime in the 1920's that the size of the court itself was regulated. 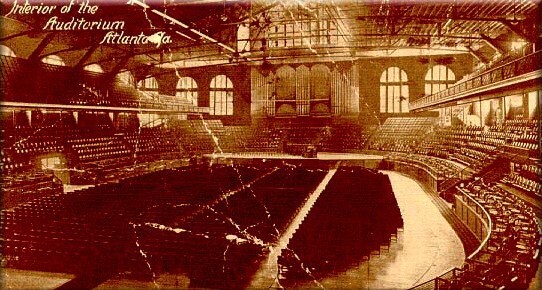 There's also the story of the conference tournament held in Atlanta where a temporary elevated floor was placed in the Atlanta Auditorium (at stage height). During one game, a Kentucky player was reportedly driving down the court for a layup and put so much weight on the floor that he opened a hole in the floor. Another aspect of early gymnasiums was the lack of central heating or lighting. Instead large pot-bellied stoves were placed near the court along with gas-fired globes for lighting. These posed particular hazards for the players, with reports of burns or the shattering of light fixtures common at the time. FWIW, I haven't seen anything mentioned about the use of cages in college basketball like you hear about in urban pro basketball arenas. 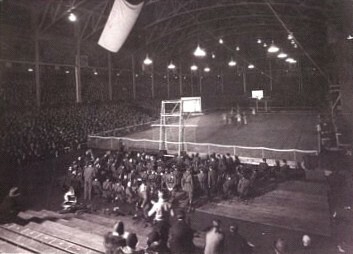 The below photo shows a netting that was constructed at Michigan State's Demonstration Hall, but more often the crowd was not physically restrained from the court.